Notoxus litigiosus, from Dmitry Telnov. The Anthicidae are a family of elongate, usually hairy beetles which have the back of the head constricted into a distinct 'neck'. Most species are found in decaying vegetation or leaf litter, and are believed to be scavengers. A number of species of the subfamily Anthicinae are found in association with ants which they resemble in superficial appearance. Members of the subfamily Notoxinae have a tuberculate anterior projection of the pronotum overhanging the head. Characters (from Lawrence & Britton 1991): Elongate, black, brown, yellow or red, sometimes bicoloured, almost always clothed with decumbent and/or erect hairs. Antennal club, if present, very weak; head usually abruptly constricted behind eyes to form neck, antennal insertions exposed; eyes not to only slightly emarginate; apical segment of maxillary palp slightly to strongly expanded apically, often securiform or cultriform; pronotum without lateral carinae, almost always constricted at middle, near base, or at base and apex; mesepisterna meet or almost meet at middle; penultimate tarsal segment lobed beneath; first two ventrites usually free. Larvae elongate, parallel-sided, lightly sclerotised or occasionally with dark and light pattern dorsally. Antennal sensorium usually broad and dome-like; usually with single pair of well-developed stemmata (occasionally five); median endocarina sometimes present; mandibular mola usually reduced and sub-basal; mala usually simple (occasionally cleft); S9 usually simple (occasionally two basal teeth); urogomphi, if present, often with accessory mesal processes near base; segment 10 more or less transverse, posteroventrally oriented. [ED04] Ewers, R. M., & R. K. Didham. 2004. A first assessment of New Zealand beetles restricted to large forest areas. Weta 27: 33–40. [H61] Hille, J. C. van. 1961. 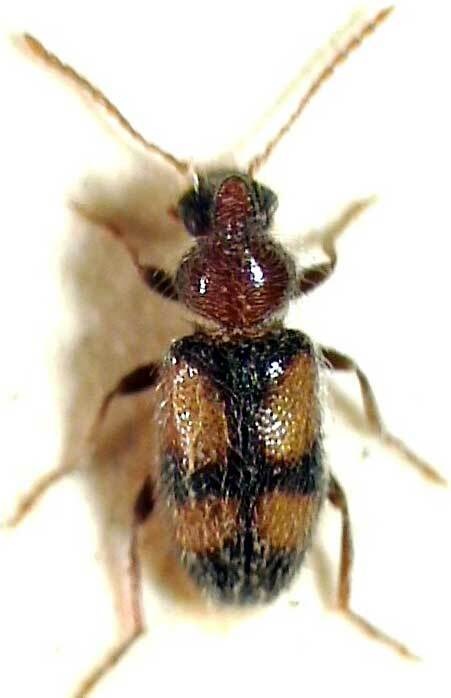 Coleoptera: Anthicidae. In: Hanström, B., P. Brinck & G. Rudebeck (eds) South African Animal Life: Results of the Lund University Expedition in 1950–1951 vol. 8 pp. 217–258. Almqvist & Wiksell: Uppsala. [K08] Klaus, D. 2008. Triungulinus-Aggregationen von Meloë proscarabaeus L.—Beobachtungen aus Sachsen-Anhalt und Sachsen (Insecta, Coleoptera, Meloidae). Mauritiana 20 (2): 371–380. A species of Formicomus was a pollen-foraging pollinator of nutmeg in southern India, so clearly diverse feeders.